England (4-4-1-1): Hart, Johnson, Terry, Lescott, Cole, Milner, Gerrard, Parker, Young, Rooney, Carroll. Italy (4-1-3-2): Buffon, Abate, Bonucci, Barzagli, Balzaretti, Marchisio, Pirlo, De Rossi, Motta, Cassano, Balotelli. The three lions come face to face with the Azzurris in a thrilling quarter final clash in Kiev tonight. Roy Hodgson’s England will looking to put an end to their quarterfinal jinx as the Italians will hoping to put their poor track record in major tournaments off late behind them. Roy Hodgson will be suffering from a classic dilemma of choosing from his three forwards all of whom have been in splendid form so far. With Wayne Rooney back from suspension, the English strike force looks stronger than ever. The likes of Carroll and Welbeck have already scored in the tournament and have been in good touch so far. However, England’s problem lies in their defence which has been pretty fragile from the start of the tournament and has been leaking goals with consistency. Looks can deceiving and the resilient look of the English backline is way too deceiving for Hodgson’s liking. Poor positioning sense and lack of good cover from the midfield meant that the likes of France, Sweden and Ukraine troubled the English defence continually throughout the group stages of the tournament. Coming up against mighty adversaries in Italy, England will have to tighten the screws in order to have any chance of advancing further into the tournament. England may well have to change their usual game plan against the Azzurris who are likely to field a crowded midfield which may be a bit too much for England to deal with especially with their usual 4-4-1-1. England will have to add to the duo of Gerrard and Parker at the heart of the midfield in order to avoid being overrun by the exceptional Italian midfield. There is no doubt that the game is likely to be won or lost in the midfield. The one who controls the proceedings will have more chances of coming out victorious. England will be looking to keep it simple and tight at the back. Hodgson is expected to inculcate his trademark philosophy of Organisation and resilience. England’s set piece prowess and long range abilities in the form of Gerrard, Young and Rooney means that the three lions will be looking to nick the game rather than playing a passing game and looking for a comprehensive victory. Italy on the other hand will be looking to take charge of the game right from the start and control the proceedings with the lion’s share of possession. Blessed with one of the best midfields in the world featuring the likes of Pirlo, De Rossi, and Marchisio, Italy is likely to be far superior in comparison to their opponents at the heart of the midfield. The Italians have had a very good tournament so far and the Azzurris seem to be hitting the right notes at the right time. Along with the midfield, the Italian forwards have also been in inspirational form with the likes of Balotelli and Di Natale scoring in the group stages. However, Italy could find themselves in a bit of trouble dealing with the Liverpool centre forward, Andy Carroll should England decide to start with him. Earlier in the tournament, the likes of Jelavic and Mandzukic troubled the Italian defence continuously with their physical presence and heading prowess. Especially with Chiellini absent, England might just have found something to exploit. The Juventus defender is out with a thigh problem and is expected to be replaced with his Juventus teammate Bonucci. Roy Hodgson will surely have that in mind when his team takes on the Italians in Ukraine tonight. 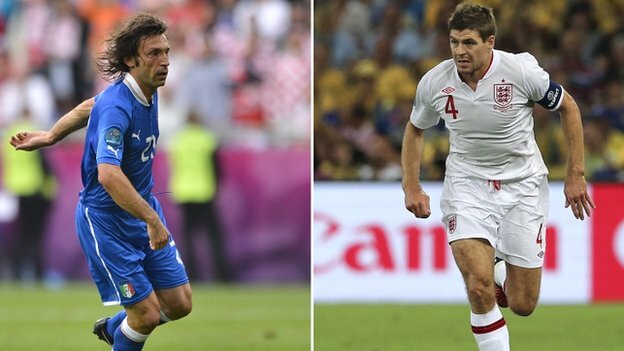 Both teams will be looking up to their key men in Pirlo and Gerrard for inspiration and leadership and one who gets it right may as well lead his team into the Semi-finals. It’s expected to be a tight game with chances far and few. The team that utilises their chances the most will be the one making their way to the semi-finals where Germany awaits. Prediction – England 1-0 Italy. Sorry if my comment on the other post sounded a bit harsh, I really enjoy reading your match previews. Keep up the good work. Thanks and keep the comments coming.Really helps us a lot.